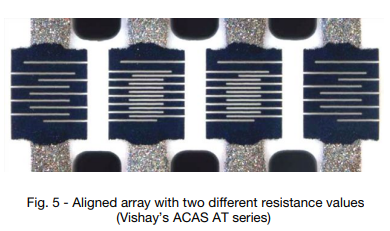 Thin film chip resistor arrays consist of several resistors of equal or different values combined in one package. During the manufacturing processes and the device’s lifecycle, all the particular resistors virtually experience identical conditions, which allow the specification of their relative tolerances, relative temperature coefficients, and even a relative resistance drift. These relative parameters provide precise and stable resistance ratios and far better long-term stability of feedback circuits and voltage dividers compared to discrete resistors.